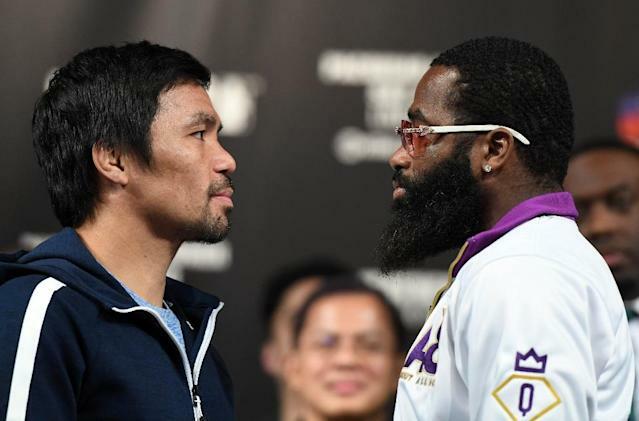 Las Vegas (AFP) - Filipino star Manny Pacquiao tipped the scales half a pound lighter here Friday for his WBA welterweight title bout against Adrien Broner. A trim-looking Pacquiao, who faces Broner at Las Vegas's MGM Grand Garden Arena on Saturday, weighed in at exactly 146 pounds. Broner, who is determined to wreck what will be Pacquiao's first fight on US soil since 2016, came in at 146.5 pounds. "I'm happy to be back here and happy to fight tomorrow night," Pacquiao said. "Forty is just a number, it doesn't matter that I'm 40 years old -- I feel young," he added. "Tomorrow I have something to prove: that at 40 I can still be at my best ... I want to prove that Manny Pacquiao is still there." Pacquiao (60-4-2, 39 knockouts) last fought in July last year, when he scored his first knockout in six years with a seventh-round stoppage of Argentina's Lucas Matthysse in Kuala Lumpur. Pacquiao, who holds the lesser version of the WBA's two welterweight belts, is widely believed to be angling for a rematch with retired welterweight king Floyd Mayweather. Mayweather won their money-spinning first bout in 2015 in a contest that failed to live up to its "Fight of the Century" hype. "I feel good. It's a helluva opportunity," he said. "After I win tomorrow night I'll be a legend overnight."